Yearbook printing is now more affordable than ever thanks to Photogalley. 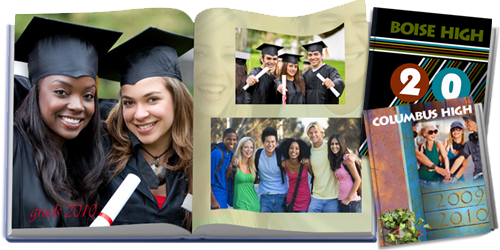 Design a beautiful full color hardback yearbook with Photogalley's online yearbook design software. Choose from a number of yearbook templates and themes or design your own school yearbooks. Yearbook publishing online is free to share with friends or the whole Photogalley community. Hard copies printed at the most affordable prices in the country with many options to choose from, starting at 1 copy with quantity discounts available. Yearbook records the wonderful school years in school. The past school time is so precious, and the best way to keep the memories is no more than creating a full color hard cover yearbook! With hundreds of yearbook and photo book themes, thoundands of backgrounds and design stickers, making yearbook online is incredibly easy and fun. Just upload your pictures, auto flow the pictures into our templates, you can have a yearbook created in very short time! Then, you can either share your yearbook online with friends and family free of charge; or, you can select from soft cover and hard cover options to print this yearbook. Photogalley allows you to print your yearbook from just one copy to multiple copies. We offer the most popular yearbook size of 8.5"x11" for your personalized yearbook printing.